The technique of tunable diode laser absorption spectroscopy (TDLAS) incorporates many important features that are necessary for trace atmospheric measurements. These include high sensitivity, high selectivity, high precision, fast response and versatility when measuring a number of species of atmospheric interest. TDLAS is a spectroscopic technique utilizing lead salt diode lasers. A single rotational-vibrational line of a molecule is slowly scanned. Reduced pressures are required to minimize pressure broadening which also reduces interferences. Multipass cells are used to increase the pathlengths to 100's of meters thereby increasing the sensitivity. TDLAS can be used to measure a number of trace gases of atmospheric importance. Trace gas species such as HCHO, HONO, HNO3, NH3, H2O2, and NO2, can be measured to sub ppbv concentrations with high time resolution. The TDLAS has been successfully used in a number of field campaigns. 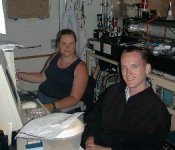 These include measurement of NH3 and H2O2 during PACIFIC 2001, NH3 during SONTAS 2000, HCHO during Egbert 1998, HONO during Toronto 1998, and HCHO during NARSTO 1996. 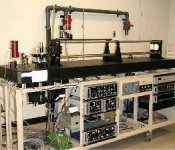 In addition, TDLAS has been successfully used for a number of intercomparisons, line strength investigations and examination of atmospheric processes in the laboratory. Development of an airborne version is presently in the testing stages and should be soon ready for test flights. Updated on January 22nd, 2013.